On my way to return the Breva and pickup a Moto Guzzi California Classic, I noticed a couple of things not found during the 850 Breva test. Firstly, the Breva rider�s seat got uncomfortably hot (it was a very hot day) and secondly it didn't like being stuck in Sydney traffic! I was forced to keep the bike moving and for the first time in my life, I had to lane split! Still, it doesn't change my opinion, I love the Breva. Now, the California, here's a model that's been around for decades and unfortunately it feels like it too! It may well be that after 2 weeks of the Breva I was expecting too much, but, the Cali lacked the crisp and sharp feel I had anticipated. There is plenty of torque from the 1100cc engine, but it somehow feels tired. There was something I was unable to point my finger on about it, I can't really describe it. The exhaust note is just loud enough without being intrusive and I found it very pleasant. Handling is great with ground clearance superb, but, it comes with a trade off, and that being, a cramped rider position for anyone over 5 foot 9 inches tall. At 6 foot, I felt like my knees were up at chest height! And, over a couple of hours it certainly became uncomfortable. For those under the stated height, you may well find the Cali perfect. 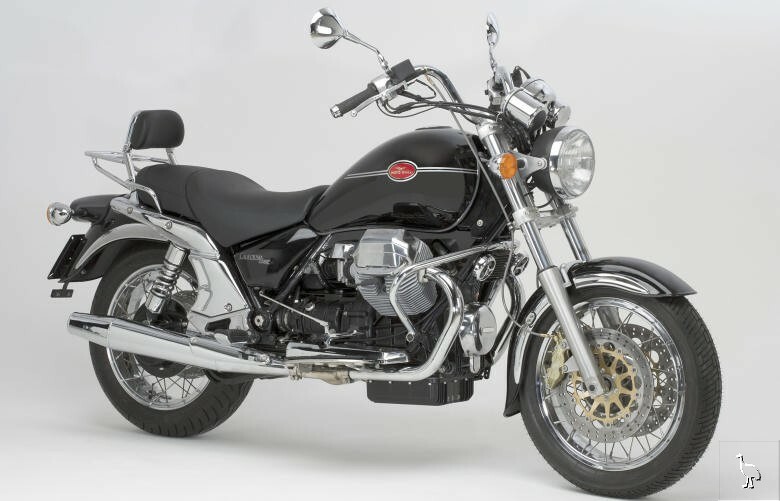 The style of the bike is attractive and may well be the reason behind its popularity plus that of the old Honda CX500. It has one of the longest side stands I�ve ever seen though. 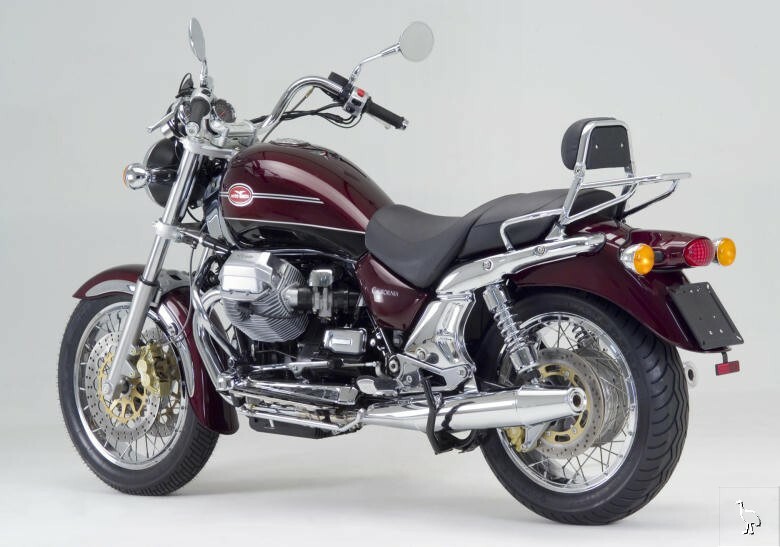 There is a centre stand as well as the side, and this will make owner maintenance easy. Out on the road, I found more neutrals than Mick Doohan has race wins! The answer was to use the heel shifter, and the test bike required me to use it very positively. Mirrors are clear at most speeds and the horn had more than adequate volume. Nice clean shaft drive, plenty of chrome and quality paintwork will give the new owner more time on the road and less time in the shed. Brakes are not outstanding but more than adequate for the task. The footbrake took a little getting used to. I had to physically lift my foot off the footboard to use it! Fuel economy was looking pretty decent, however, unbeknown to me, a hose had parted company with the fuel pump and I found myself rolling silently to a halt not far from the Wyong exit on the Newcastle/Sydney Freeway. JSA were brilliant in getting me and the Cali picked up, but it meant saying farewell to the test at that point. It only took 30 minutes to fix but it wasn't something I could diagnose where I was, out on the freeway. It isn't a heavy bike to push either, I�m moderately fit at 51 years of age and I chose to shuffle it up the closest off-ramp so I could roll it down to a shopping centre for a cooling drink while waiting for said pickup. Even though I'd only spent a few hours with the Cali, I found it easy to read and quickly knew what to expect of it. Did you ever get one of those report cards at school where the teacher wrote �shows potential�? Well, the Cali would get one of those reports and if the factory ever decides to freshen it up (basically unchanged for 20 years), it would be a great cruiser. There�s a lot of cruiser choice out there and at $20,990 RRP for the Cali, you need to shop around.